Laptops are indispensable these days, but their downfall is their battery life. You can start each day with a fully charged battery, but it doesn’t take too long before its capacity starts to diminish. There are plenty of things you can do to prolong the charge in your battery. Some of these tips you might like to put to use regularly to get the most from your battery – others you might like to keep in mind when you’re trying to eke out every last second before your screen goes black! Today's post is for Windows laptops - later in the week I'll post details for the Macbook users. From the Control Panel, select Hardware and Sound, then Power Options if you use Category view, or select Power Options if you use Icon view. 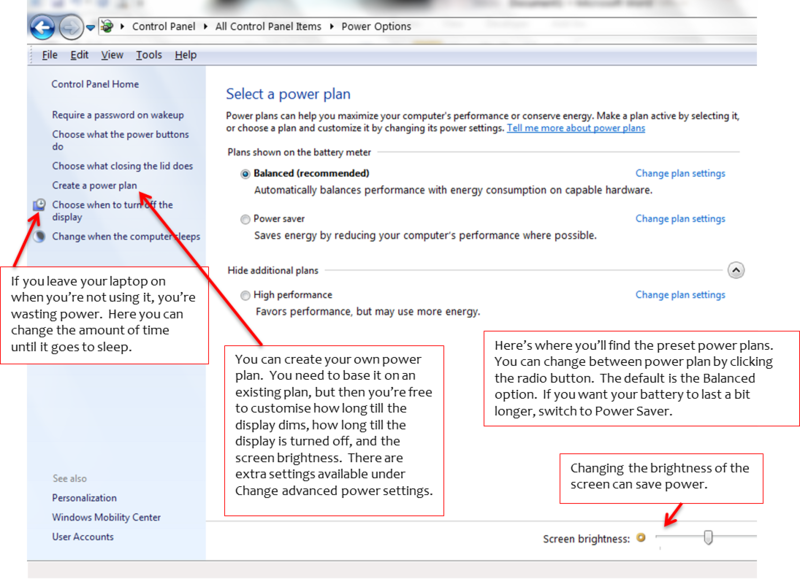 There are a few changes you can make in this window to save some power. Graphics can really use up battery power. In the Search box at the bottom of the Start Menu search for Performance and choose Adjust the appearance and performance of Windows. Choose Adjust for best performance in the next window. This will remove all the 3D Windows effects, so it will make Windows look a lot less exciting, but it will save a lot of power. Click Apply once you’ve changed the settings. Windows will spin and read any CDs or DVDs in the drive, which uses battery power. Remove the disks if you’re not using them. If you don’t need to be online, turn off your wireless adaptor. Just disconnecting doesn’t do the job – your laptop keeps looking for available networks and this is a very power hungry job. Disabling your wireless adaptor is usually done with the function keys (check your computer’s user manual – usually in your All Programs list). My Acer uses <Fn> + < F3> to toggle between off and on. Turn off all the Windows 7 graphics and make your laptop look like it’s back at Windows 2000. Right-click on the desktop and select Personalise. Under Themes, choose Windows Classic. USB drives and a wireless mouse use your battery power to run. So don’t leave that USB stick connected if you’re not using it. Removing the mouse might be a bit of a problem if you don’t like the touchpad, but maybe you could switch to a cabled mouse instead. Unless you’re listing to music (which you probably shouldn’t be if you’re trying to make your battery last), or watching a video (again – why?) you don’t need your speakers on. Mute your speakers and save some a little more power. If you use even some of these tips you’ll gain more battery time, which can make all the difference when you’re desperate to finish a job and there’s no power point around. Most laptops use batteries that can last for 3-5 years, or about 1000 charges. (A premium laptop's battery might last longer.) Every time you charge your battery, the total capacity of the battery is diminished. Originally it may have had a run time of 3.5 hours, but after a year it'll run out of juice at 3 hours, even on a full charge.